Here's Part I of my U-Ark series. 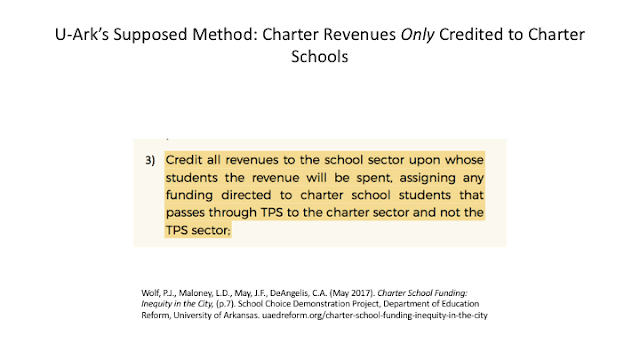 This post really should be called "U-Ark Screws Up A Charter School Revenue Study, AGAIN: Part III," as it is a follow-up to my last two posts about how the University of Arkansas Department of Education Reform messed up its latest study of charter school revenues. I'm retitling it, however, because I think the facts I present below have significance beyond critiquing U-Ark's report. As I showed, U-Ark's claim that Camden's charter sector is receiving far less funding than the city's public schools is completely bogus (and this almost certainly applies to the other cities in their study). They double count revenues going to charter schools without attributing them to those schools' students. They don't understand that since the district has the responsibility for transporting charter students, revenues allotted for that purpose shouldn't be attributed to the district. I'd go on about the many other methodological failures in the study, but Bruce Baker covered them when he reviewed U-Ark's report from 2014. Amazingly, U-Ark cites Baker in their latest report -- but then goes back and makes the same mistakes. Which wouldn't be so bad if the study was being ignored and wasn't influencing policy makers; unfortunately, it appears stakeholders are heeding the study's conclusions. This, by the way, is a huge problem in education policy journalism right now: reporters will often trumpet a "new study" that knowledgable critics haven't had time to properly vet. Even if it's a piece of junk, it still gets attention; at best, the critics are given a "he said-she said" positioning that leads stakeholders to believe that even if the study has problems, it's probably still making at least a somewhat valid point. Inequitable funding between public charter schools and TPS could be due to differences in the number of students identified as requiring SPED [special education] services, as described in Table 2. To test this ubiquitous claim regarding the charter school funding gap, we depart from our normal approach of focusing exclusively on revenues and consider SPED expenditures by both school sectors. As I've noted previously, the documentation of data sources in this report is so bad it's impossible for me to replicate the report's analyses. 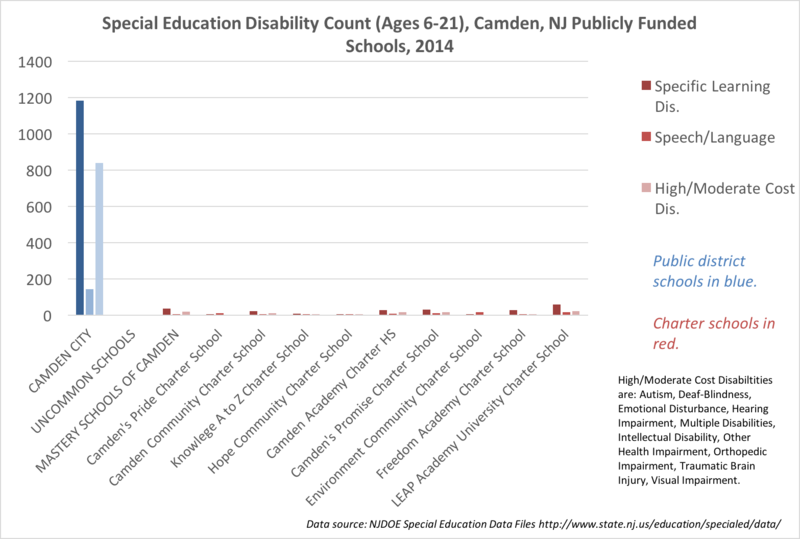 There's also a serious problem when making these comparisons, as the amount spent on special education is not necessarily the amount that should be spent. In other words, if the charters or TPSs are short-changing what ought to be spent to properly educate a special needs student, that's going to affect the spending "gap." In no way, then, is this analysis adequate for making claims about charters being underfunded. 2014 is the last year for which we have good data on the types of learning disabilities students have. Specific Learning Disabilities (SLDs) and Speech/Language disabilities (SPL) are lower-cost classifications (that comes directly from a report commissioned by the state in 2011). Students with the other disabilities, such as autism, traumatic brain injury, visual impairment, and so on, require more resources to receive an adequate education. 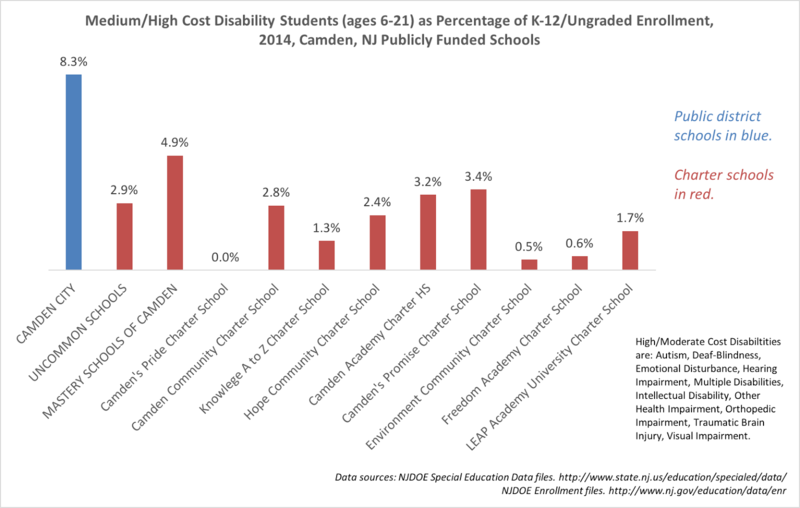 Very few students with the costliest learning disabilities enroll in Camden's charter schools; this is also true across New Jersey, and across the nation. 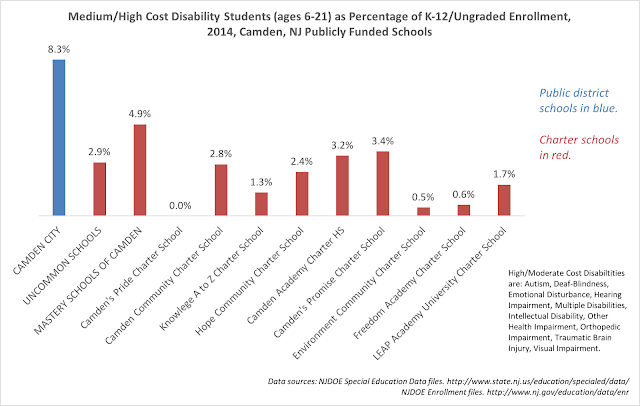 As a percentage, Camden City Public Schools enroll far more special needs students with the costliest disabilities. It's worth noting that most of these students in the charters are classified as "Other Health Impairment," a catch-all phrase that includes students with asthma and ADHD. Which means many of these students could still have disabilities that are relatively easily treated and don't require much support. 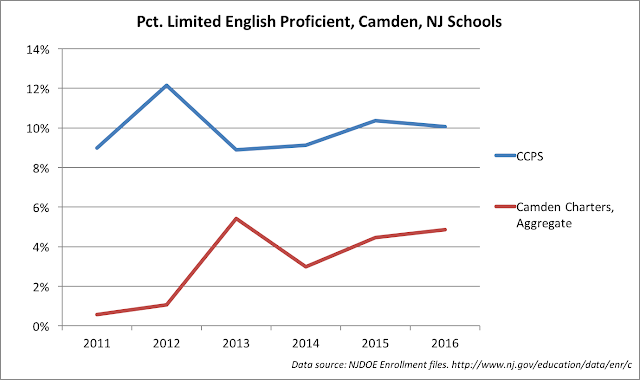 The percentage of Limited English Proficient (LEP) students in CCPS is consistently greater than the percentage in the charter schools. This obviously requires CCPS to spend more per pupil, as LEP students needs special services. Camden has many free lunch-eligible (FL) students in both the charters and in CCPS schools. 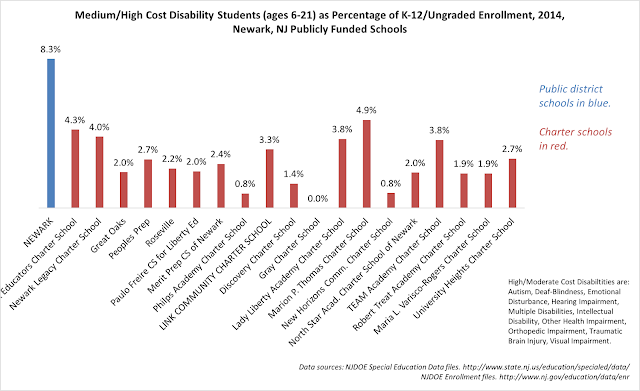 The New Jersey funding formula, SFRA, directs more resources to schools with more at-risk students (as it should). But recently, CCPS moved to a universal enrollment system for subsidized student meals. I certainly applaud this, but it makes research more difficult. There is now no incentive for CCPS families to enroll in the program; in contrast, charters do rely on FL enrollment numbers to pass more money through to them from the district. Which makes the FL statistics unreliable. But the measure was never very good to begin with: all it shows is how many students fall below 130 percent of the poverty line. There are lots of reasons to believe there's great variation within that group of students. I'm not sure U-Ark could have done anything about this, but they should at least acknowledge the issue. 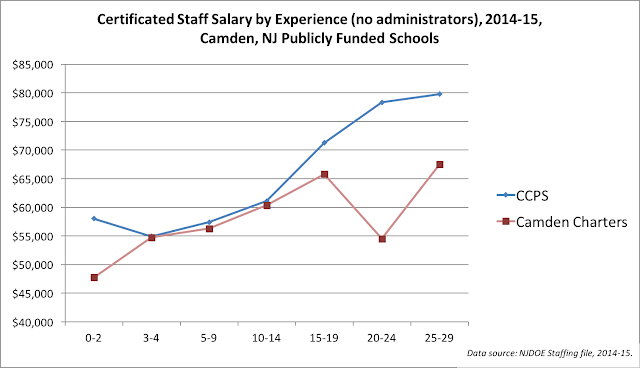 The charter sector relies on staffs that have far less experience than CCPS teachers. We know teachers gain the most in effectiveness in their first few years, so this is a serious concern. But there's another problem related to U-Ark's study. CCPS has many more teachers with a decade or two of experience than the charters. This affects the payrolls of each sector. 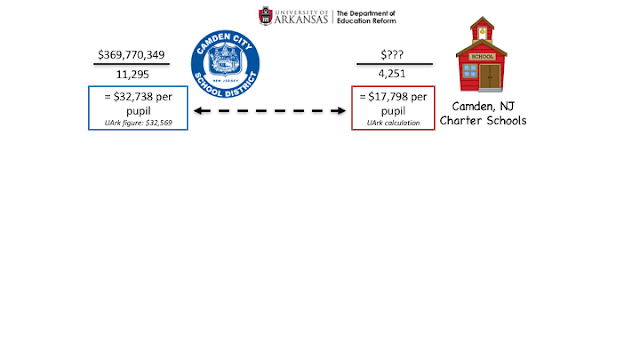 I was a bit surprised when I saw this, because teacher salaries tend to be much lower in charter schools. But starting around year 3, salary schedules are about the same... until you get to the second decade. 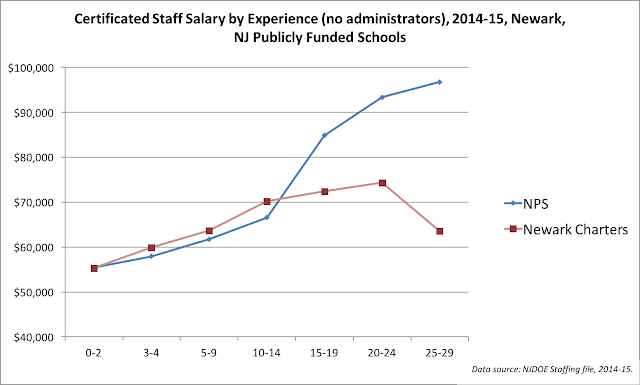 That's when CCPS salaries start to rise at a steeper slope, leaving charter salaries behind. Why does this matter? 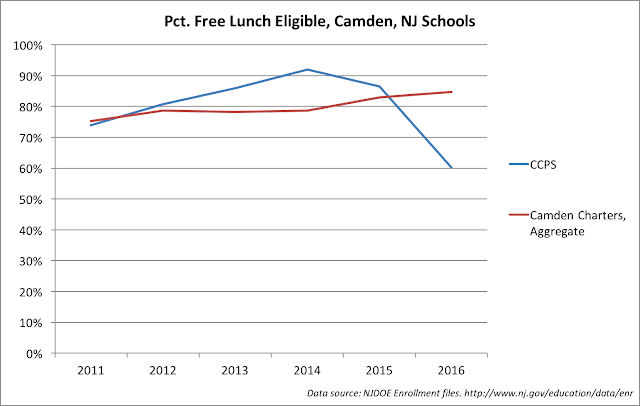 As Martin Carnoy has recently pointed out, it sets up a "free rider" problem for CCPS. 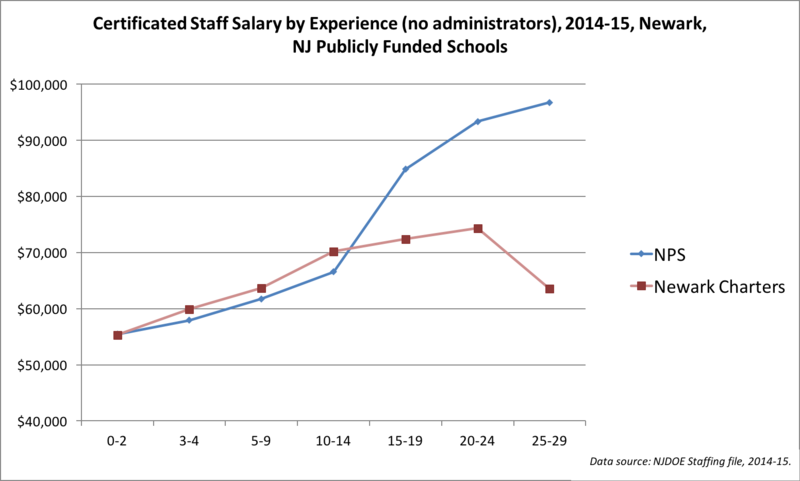 Charter teachers accept less pay because they don't expect to stay in the job very long. Maybe they will move on to another field; maybe they'll switch over to a public school district, which will give them better pay in the future. The charters can offer less pay now because teachers can expect more pay later when they aren't working in the charter. Between the special needs students and the free-riding on salaries, it's increasingly clear the charter sector couldn't sustain its model without the public schools spending more money. But the charters still draw significant revenues. What do they spend it on? 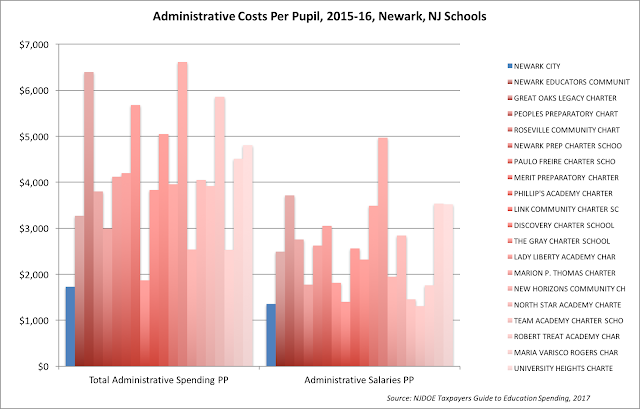 Charter school administrative spending is far in excess of public school spending. It's possible charters have to spend more because they churn their teachers, requiring more administrators to work with perpetually inexperienced staffs. It's also likely charters are too small to achieve economies of scale, a fact Bruce Baker pointed out recently. Charter schools spend far less on student support services, likely because they have fewer students who need those services. Services include child study teams, therapists, school nurses, and other staff who spend much of their time serving students with special education needs. Some charters don't report any spending on these services. None of these realities are explored in U-Ark's report. 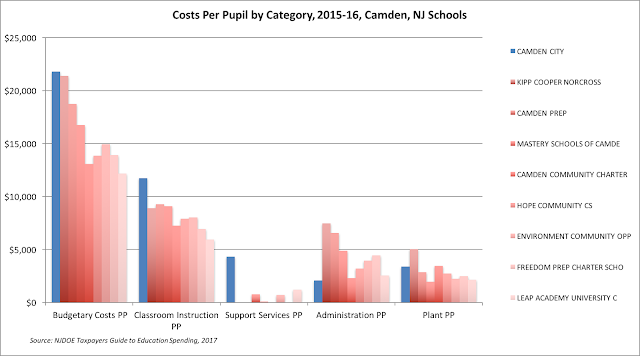 And yet every one of them is relevant to U-Ark's claim that: "Public charter schools in Camden, New Jersey, are the most underfunded, receiving an average of $14,771 less in per-pupil funding that TPS, representing a 45 percent funding inequity." This is a bogus, sloppy, unwarranted comparison; no policy should be enacted based on U-Ark's claims. 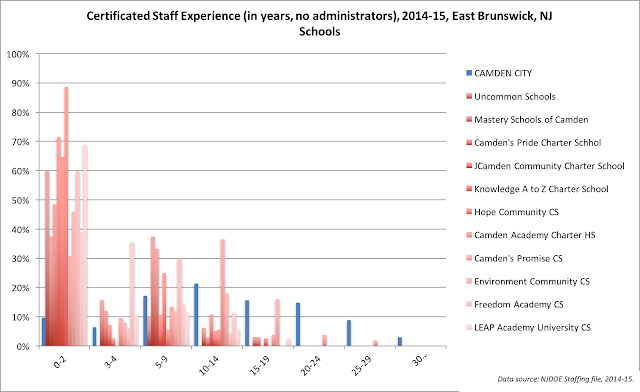 In fact, based on their analysis of Camden alone, the entire report should simply be dismissed as unreliable. Again: this isn't anything new. U-Ark has been repeatedly criticized for its work in this area. And yet they plow ahead, with the blessing of both their funders and the university that hosts them. Why? Here's Part III, which is actually a presentation of relevant facts about Camden, NJ charter school finances. Colorado’s General Assembly on Wednesday passed a bill giving charter schools the same access to a local tax funding stream as district schools have, The Denver Post reported. 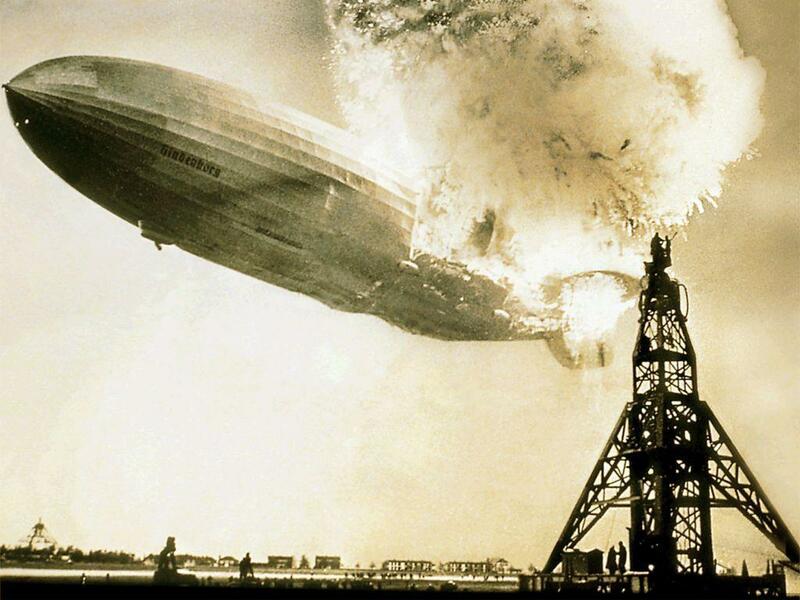 But if the U-Ark report did sway the debate, that's a big problem. Because the report is just flat out wrong. As I explained in Part I, the claim that Camden, NJ, has a huge revenue gap between charters and public district schools seems to be based on an utterly phony comparison: all of the revenue, both charter and district, is linked to only the CCPS students -- not the charter students.  Because the data source documentation in the report is so bad, I can't exactly replicate U-Ark's figures, so I invited Patrick Wolf and his colleagues to contact me and explain exactly how they got the figures they did. So far, they remain silent. But that isn't surprising. When U-Ark put out its first report in 2014, Bruce Baker tore it to shreds in a brief published by the National Education Policy Center. The latest U-Ark report cites Baker's brief, so they must have read it -- but they never bothered to answer Baker's main claim, which is that their comparisons are wholly invalid. "Choose" not to spend the revenues? Sorry to be blunt, but that statement is either deliberately deceptive or completely clueless. * In New Jersey, hosting public school districts are required to provide transportation for charter school students. The charters don't "choose" not to spend on transporting the kids; they avoid the expense because the district picks up the cost. Baker pointed this out explicitly in his 2014 brief -- but U-Ark, once again, refuses to acknowledge the problem, even though we know for a fact they read Baker's report, because they cite it repeatedly. 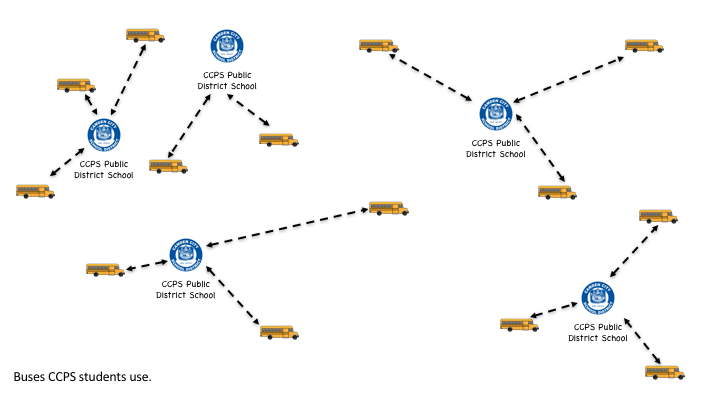 For the sake of illustration, here's a simplified conceptual map of what Camden's public district school bus system might look like. We've got neighborhood schools divided into zones, and buses transporting children to their neighborhood school. ** There are exceptions, of course, primarily for magnet and special needs students, but the system on the whole is fairly simple. There has been a marked decline in "active transportation" -- walking or biking -- to school over the past few decades, and school "choice" is almost certainly a major contributor. As we de-couple schools from neighborhoods (which may well have many other pernicious effects), transportation networks become more complex and more expensive. As I said: New Jersey law requires public school districts like Camden to pay for transportation of charter school students. Which means all of these extra costs are borne solely by the district. And how much does this cost Camden's charter sector? So any comparison of revenues that doesn't exclude transportation -- and, again, it appears that U-Ark didn't exclude it, although their documentation is so bad we can't be sure -- is without merit. Claiming that charter schools have a revenue gap when they use services paid for by public district schools makes no sense. Let's take a look at some better -- not perfect, but better -- financial comparisons between Camden's charters and CCPS next. Here's Part II of this series. But when you've been called out in public for making a big mistake, and you don't at least attempt to correct yourself... well, it's hard to take you seriously -- even if other, less discriminating minds do. We parents all have heard the claim that something wasn’t fair. “Suzie got a bigger piece of cake than I did!” “Tommy got to go fishing while I had to clean the garage!” “Malachi had a lot more money spent on his education because you sent him to a traditional public school and me to a public charter school!” Well, maybe we haven’t actually heard that last one very often but it would be a more legitimate gripe than the other ones. 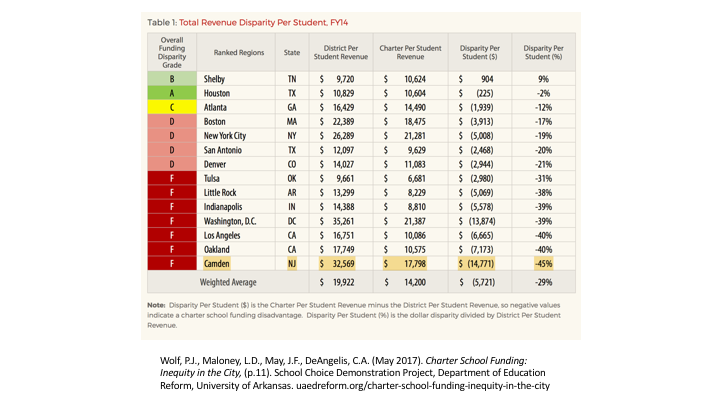 Students in public charter schools receive $5,721 or 29% less in average per-pupil revenue than students in traditional public schools (TPS) in 14 major metropolitan areas across the U. S in Fiscal Year 2014. That is the main conclusion of a study that my research team released yesterday. This is from the crew at the University of Arkansas's "Department of Education Reform" -- yes, there is such a thing, I swear -- led by the author here, Patrick Wolf. 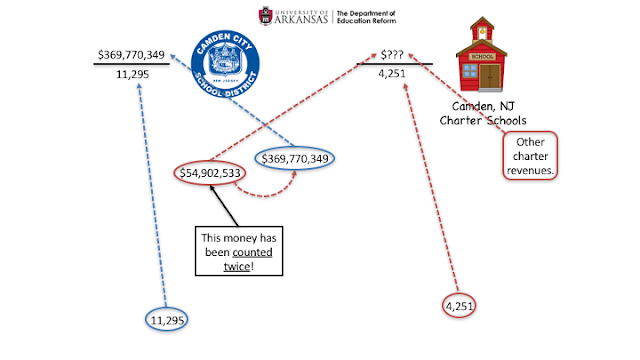 The study Wolf's team produced purports to show that charters are getting screwed out of the revenues they deserve, which are instead flowing to public district schools. As mentioned earlier, the major issue that critically undercuts all findings and conclusions of the study, and any subsequent “return on investment” comparisons, is the report’s misunderstanding of intergovernmental fiscal relationships. Again, as the authors note, they studied “all revenues” (not expenditures), because studying expenditures, while “fascinating” would be “extremely difficult” (Technical appendix, p. 385). One can get closer to the $28,000 figure by dividing total revenue for that year by the district enrollment, excluding sent pupils (charter school, out of district special education, etc.). But this would be particularly wrong and the result substantially inflated because the numerator would include all revenues for both district and sent charter students, but the denominator would include only district students. Again, Baker pointed this out in 2014. But guess what? By all appearances, U-Ark made the same mistake once again in 2017. Let me see if I can explain this with a few pictures. Unlike the U-Ark report, I'm going to tell you exactly where I'm getting my data for all these slides. The school year is 2013-14, just like the U-Ark report. The fiscal data comes from the User-Friendly Budget Guide** published by the New Jersey Department of Education; U-Ark says in its data comes from the NJDOE, so the figures should be the same. 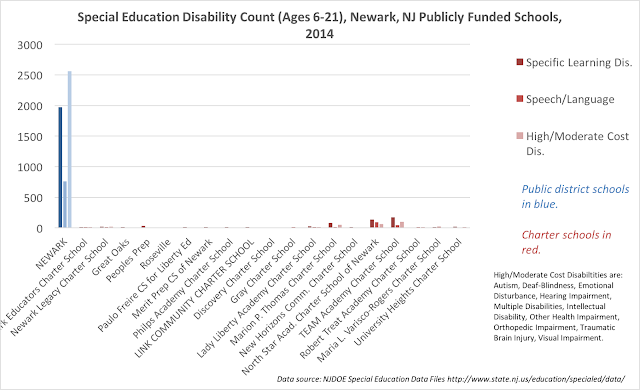 I get my charter enrollment numbers from the Enrollment data of the NJDOE, using the 2013-14 files. 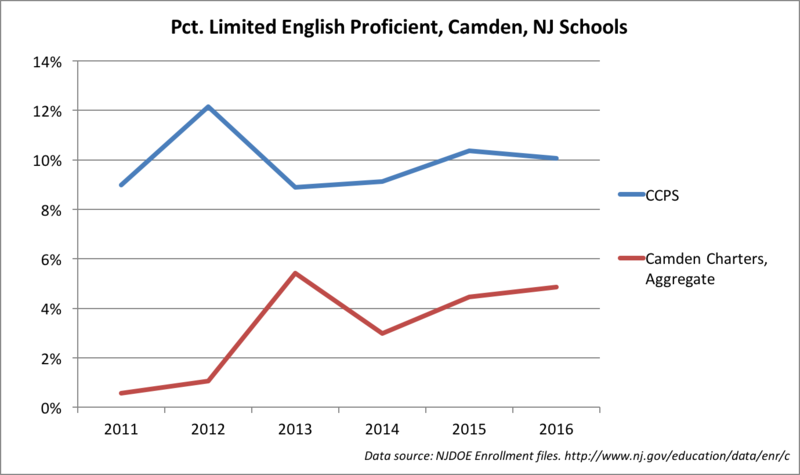 There were, according to these sources, 17,273 students in Camden's total enrollment for 2013-14. These include contracted pre-school and out-of-district placements, which we will set aside for now (even though that is a deeply flawed thing to do -- more later). If we take the total full-time enrollment -- 15,546 -- and subtract 4,251 charter students, we get 11,295 Camden City Public School students. Total revenues for the district in that year were $369,770,349. 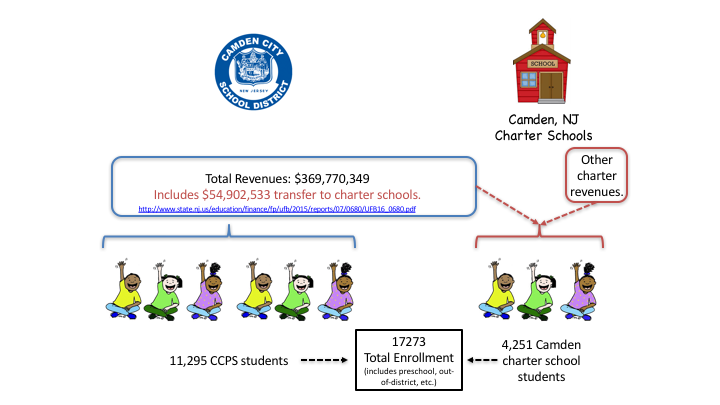 This included $54,902,533 in transfers to the Camden charter schools. Understand that this was not necessarily the only source of revenue for the charters, who might also collect funds directly from the federal government or from private sources. 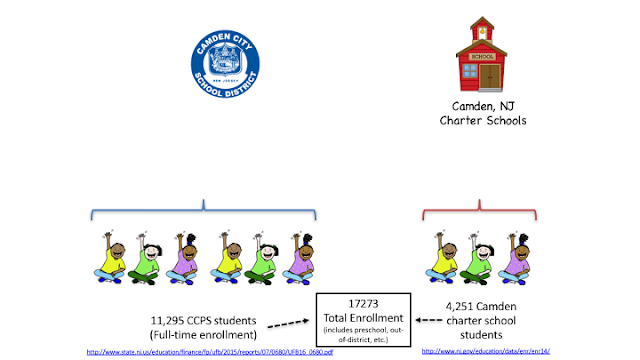 It's also worth pointing out here that all 4,251 Camden charter students may not come from Camden (although it's safe to assume the vast majority are city residents). But, as we'll see, that doesn't matter anyway. Using these figures, U-Ark steps in to make its per pupil calculations. In the numerator is the revenue collected by the district or the charter schools; in the denominator are the students enrolled in each sector. If we use all of the $370 million in the district's per pupil figure, but we only count the students in CCPS and not the charters, we wind up double-counting about $55 million. Because that money is in both the district per pupil figure and in the charter figure. 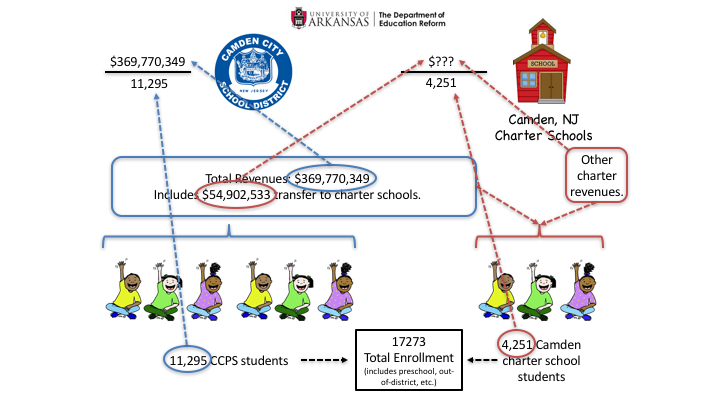 That $370 million figure -- a figure, by the way, that is deeply flawed (more in Part II), should not be the figure that U-Ark uses to calculate CCPS's per pupil figure. I'm not saying this: U-Ark is. My calculation using these figures comes out to $32,738 -- which is very close to U-Ark's figure of $32,569. Like I said, there are several reasons the figures don't match exactly: precise charter enrollment figures, including various students in out-of-district placements, minor adjustments to the revenue, etc. 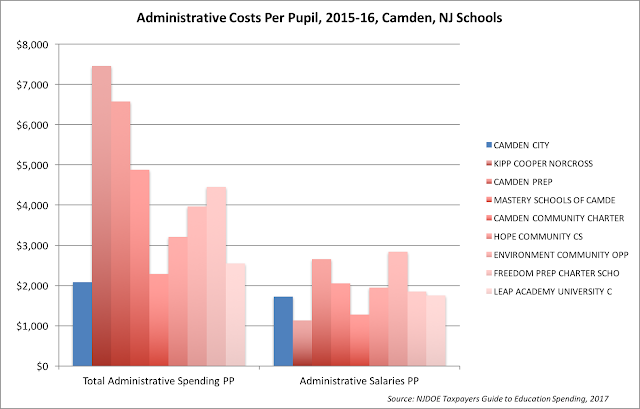 But it's clear that Wolf and his U-Ark team used the wrong revenue figure when making their calculation of Camden's per pupil spending; worse, they made the same mistake they made in 2014, even after they had been publicly corrected! Now, as I'll explain in the next post, fixing this problem still makes for a deeply flawed analysis. But let's suppose, just for illustration purposes, they had corrected it. What would the figure be? 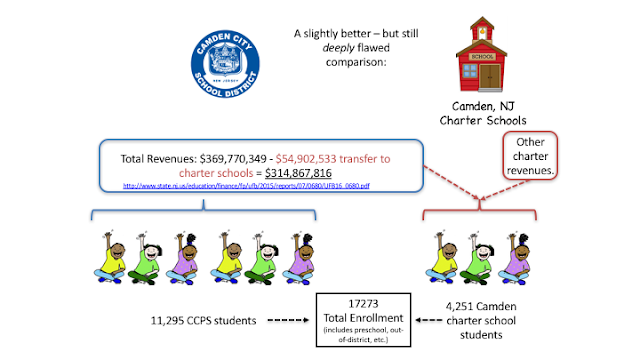 Here, we subtract the charter school transfer (find it on page 5 of the User-Friendly Summary). Which, according to U-Ark themselves, is the correct way to approach the calculation. What's the result? Again, this is a deeply flawed comparison. But it's a much smaller gap than using U-Ark's methods. Gentlemen, I have shown in this post exactly where my data came from. Maybe you have different, equally credible sources. None of us would know, however, because your sole citation for state data is: "New Jersey Department of Education, School Finance." (p. 33) If you'd care to share your sources, your data, and how you arrived at your calculations (in appropriate detail to allow for replication, a common standard in our field), then please do; I'll happily publish them here. You can reach me at the email address on the left side of the blog. But as it stands right now, there is more than enough evidence, in my opinion, to entirely dismiss your report and its conclusions. ADDING: Previous atrocities have been documented. * As always: Bruce is my advisor in the PhD program at Rutgers GSE. 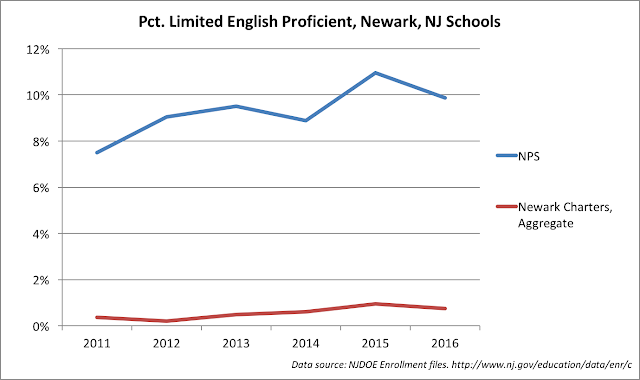 ** I use the 2015-16 guide because it gives the latest "actual" figures for 2013-14 available from NJDOE. Earlier this month David Leonhardt of the New York Times wrote yet another column extolling the virtues of charter schools. I feel like a broken record when I say, once again, that education policy dilettantes like Leonhardt don't seem to understand that it requires more than a few studies showing a few charters in a few cities in a few select networks get marginally better outcomes on test scores to justify large-scale charter expansion. There are serious cautions when it comes to the proliferation "successful" charters, starting with the fiscal impact on hosting districts as charters expand. We should also be concerned about the abrogation of student and family rights, the lack of transparency in charter school governance, the narrowing of the curriculum in test-focused charters, the racially disparate disciplinary practices in "no excuses" charters, and the incentives in the current system that encourage bad behaviors. Unlike most voucher programs, many charter-school systems are subject to rigorous evaluation and oversight. Local officials decide which charters can open and expand. Officials don’t get every decision right, but they are able to evaluate schools based on student progress and surveys of teachers and families. As a result, many charters have flourished, especially in places where traditional schools have struggled. This evidence comes from top academic researchers, studying a variety of places, including Washington, Boston, Denver, New Orleans, New York, Florida and Texas. 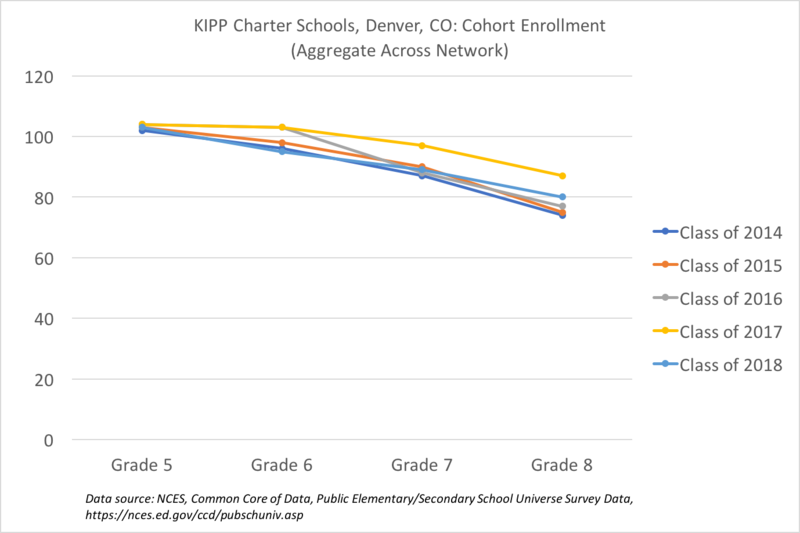 The anecdotes about failed charters are real, but they’re not the norm. You'll notice that Leonhardt picks cities and states that uphold his argument while excluding others like Detroit, Philadelphia, and Ohio. In addition: I spent a lot of time last year explaining why the vaunted Boston charter sector isn't all it's cracked up to be. 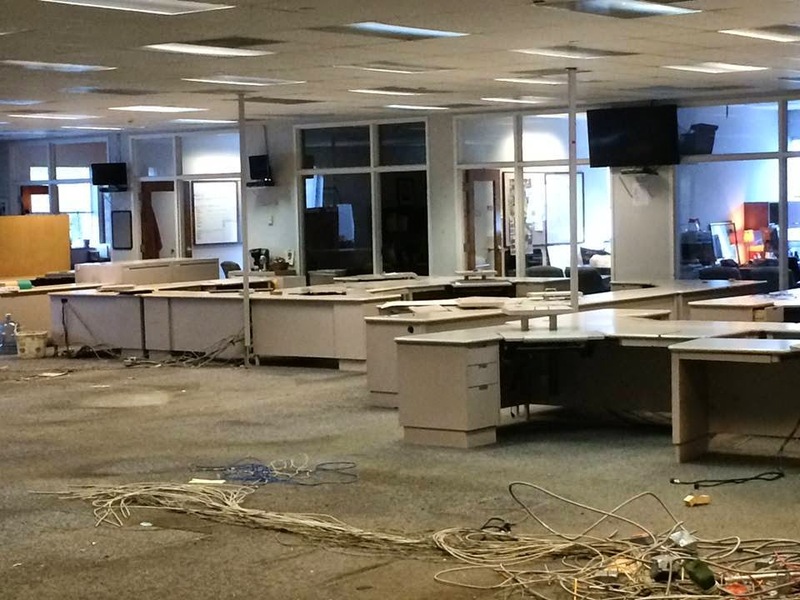 I've also documented the mess that is Florida's charter sector. I'll try to get to some of Leonhardt's other examples, but for now: let's talk about Denver. I'll admit it's one region where I haven't spent much time looking at the charter sector. Leonhardt links to a study that shows some significant gains for charters... although I have some serious qualms about the methodology used in the report. I'm working on something more formal which addresses the issue, but for now (and pardon the nerd talk): I am increasingly skeptical of charter effect research that uses instrumental variables estimators to pump up effect sizes. So far as I've seen, the validity arguments for its use are quite weak -- more to come. For now, however, let's concede the Denver charter sector does, in fact, get some decent test score gains compared to the Denver Public Schools. The question, as always, is how they do it. Do they lengthen their school day and school year? If so, that's great, but we could do that in the public schools as well. Do they provide smaller class sizes and tutoring? Again, great, but why do we need schools that are not state actors to implement programs like that? 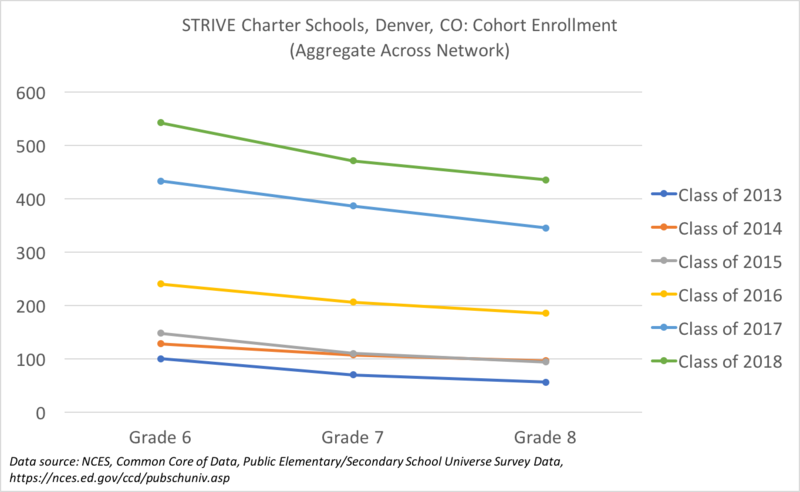 What we want to find are reasons that we can attribute only to the governance structure of charters -- not to resource differences, not to student population differences, but to the inherent characteristics of charters themselves. And one thing I've found, time and again, is that one of the characteristics of "successful" charters is that they engage in patterns of significant student cohort attrition. Let me explain what's going on here: this is data for the DSST network, one of the more lauded groups of charter schools in Denver. We're looking at the "class" of each cohort that has come through the entire charter chain; in other words, how big the Class of 2014 was when they were freshman, then sophomores, then juniors, and then seniors. I've done the same with each class back to 2008. See the pattern? 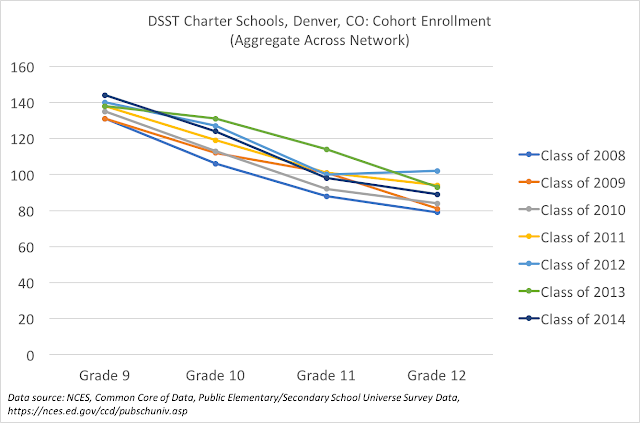 As DSST student classes pass through the charter schools year-to-year, the number of students enrolled shrinks considerably. The Class of 2014, for example, is 62 percent of the size as seniors as it was when freshmen. The shrinkage ranges from 61 to 73 percent over the eight years on the graph. Where do the kids who leave go? 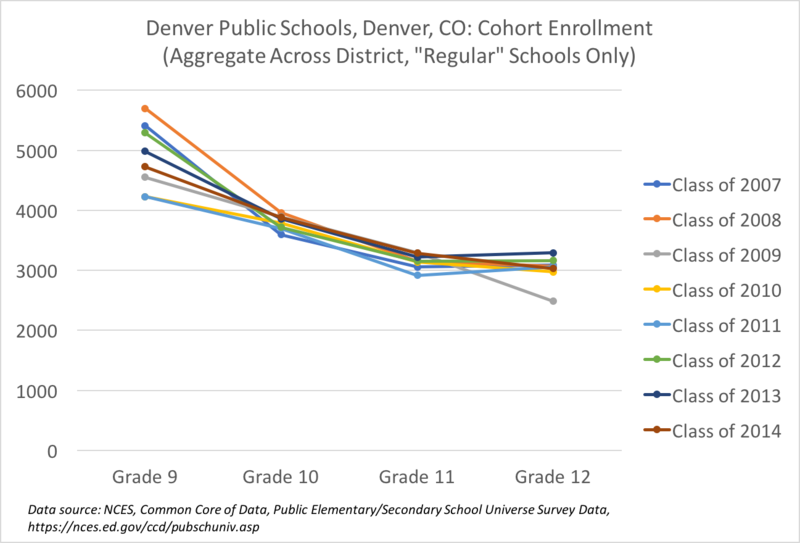 Many likely go back to the Denver Public Schools. Some of those likely drop out, which counts against DPS's graduation rate -- but not the charter schools'. In any case, they aren't being replaced, which I find odd considering how supposedly "popular" charters are. Some make the case that the larger freshman classes are due to retention: the schools keep the kids for an extra year to "catch them up." Which I suppose is possible... but it raises a host of questions. 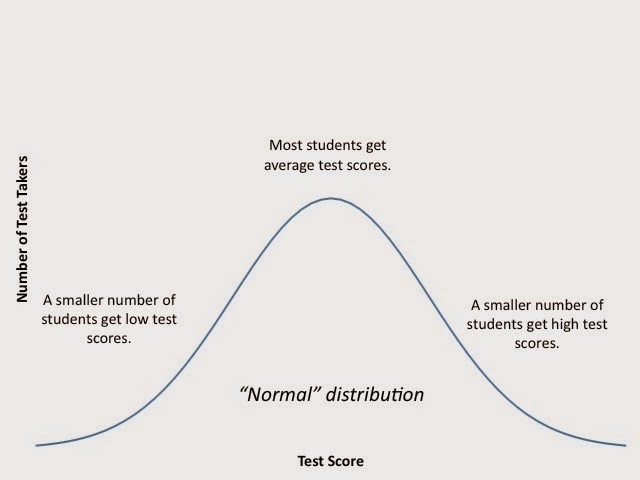 Do public students have the same opportunities to repeat a grade? Are the taxpayers aware they are paying for this? Why is there still significant attrition between Grade 10 and Grade 11? 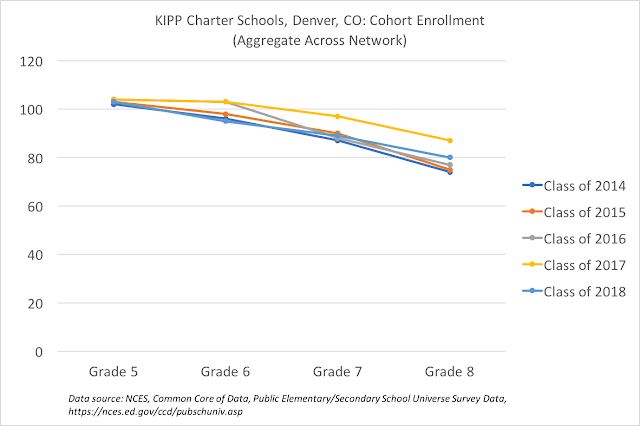 KIPP's Grade 8 cohorts shrink from 73 to 84 percent of their size in Grade 5. Again: if they're so popular and have such long wait lists -- and if the DPS schools are so bad -- why aren't they backfilling their enrollments? Note too that much of the attrition is after Grade 6. 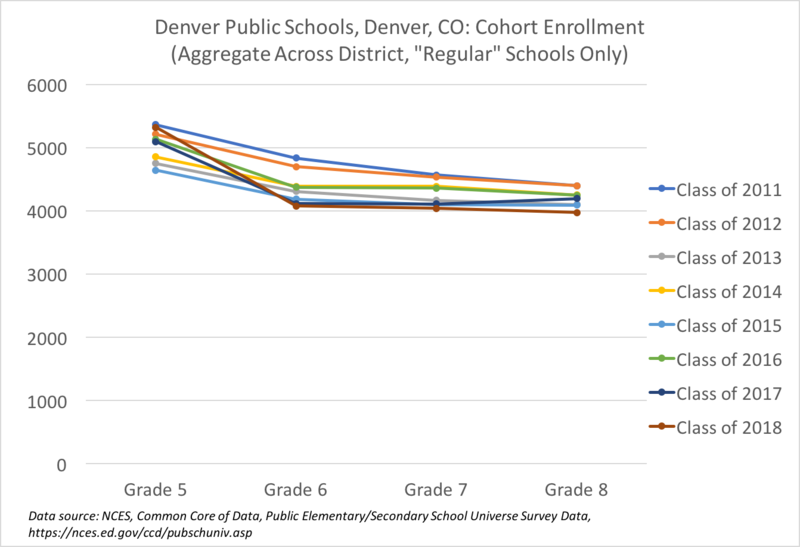 Most Denver elementary schools enroll Grades K to 5. It doesn't appear as if many students come into KIPP looking to move on after only one year; most of the attrition is in the later grades. Why would kids be leaving in the middle of their middle school experience? Grade 8 is between 56 and 80 percent the size of Grade 6. Let's look at one more: Wyatt Academy. The last class we have data for shrank to 69 percent of its size in First Grade 1 by the time it got to Grade 8. Let's be clear: cohort shrinkage occurs in DPS as well. The last year for which we have data was an outlier: the Class of 2018 was 75 percent as big in Grade 8 as it was in Grade 5. For previous years, that figure ranges from 81 to 90 percent. 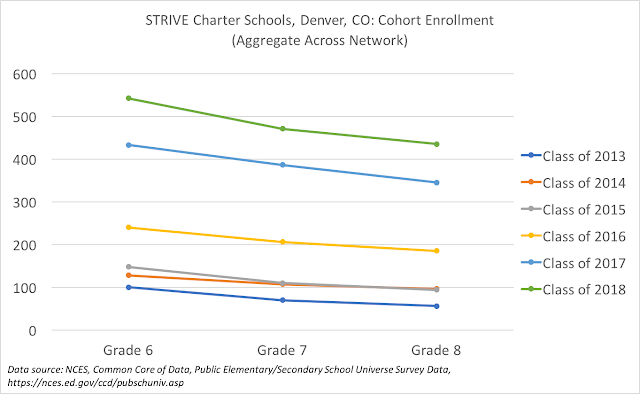 The comparisons to the charters are admittedly tricky: the transition from Grade 5 to 6, for example, is sure to see students moving out of the area or into the private schools, both from DPS and the charters. 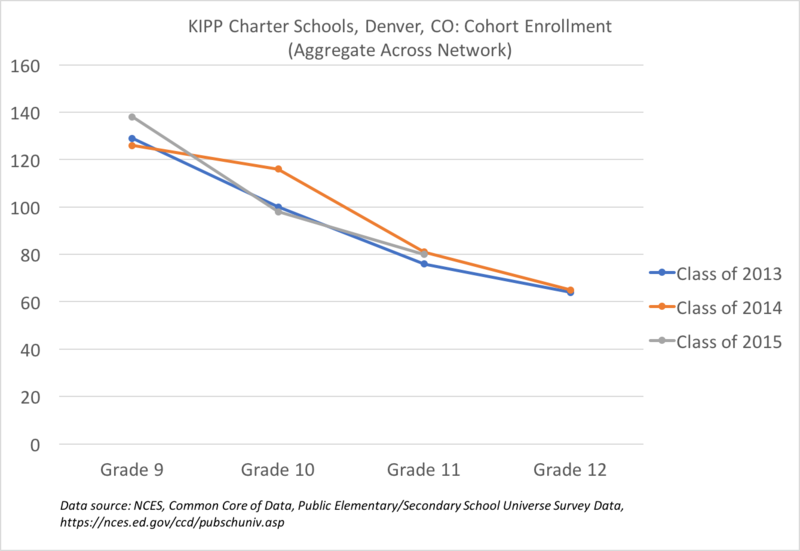 But it's still striking to me that "popular" charters, which are allegedly turning away lottery losers, seem to lose more students proportionally than the "failing" DSP schools. DPS has a large number of students leave their Grade 9 cohort before Grade 12. Many are dropouts, and that's a serious problem. But why does DPS get slammed for this while the charter high schools are declared "successful" even as they are losing at least as large a proportion of their students as the public high schools? Again, this is tricky stuff. 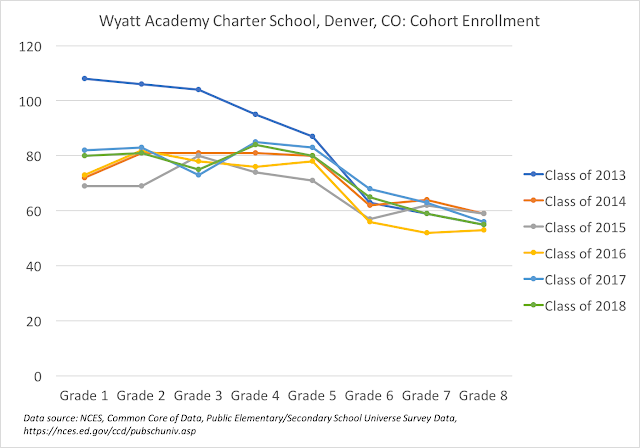 I'm certainly not going to declare that Denver's charter sector is getting all of its gains from pushing out the lower performers; we don't have nearly enough evidence to make that claim. But neither can we declare definitively, as Leonhardt does, that charter "...success doesn’t stem from skimming off the best." When you lose this many students, particularly in high school, you have to back up and take a more critical view of why some charters get the gains that they do. One more thing: look at the y-axes on my graphs. 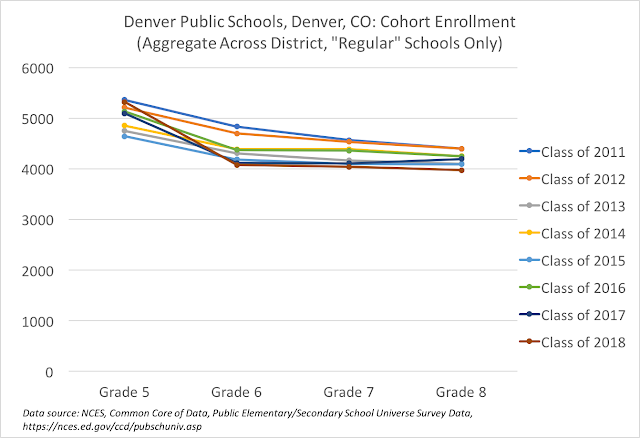 The scale of Denver charter school enrollments is nothing like the scale found in DPS. Only recently has STRIVE come around to about 10 percent of DPS's enrollment per class. How can we be sure the gains they make, if any, can be sustained as the sector gets larger? 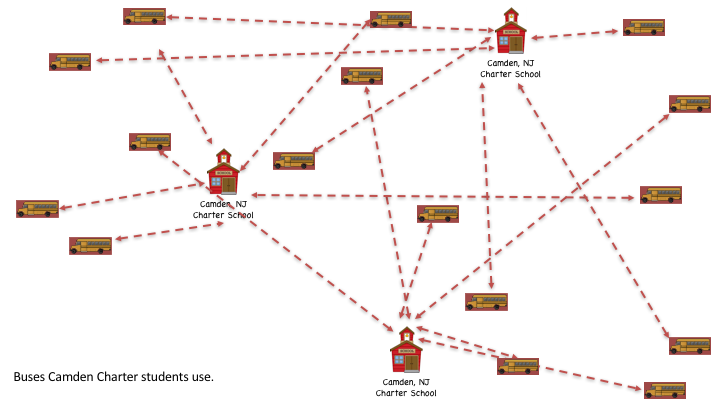 When charters shed this many kids, there has to be a system that catches them and enrolls them in school. A system that takes them at any time of year, no matter their background. A system that doesn't get to pick and choose which grades it will enroll and when. 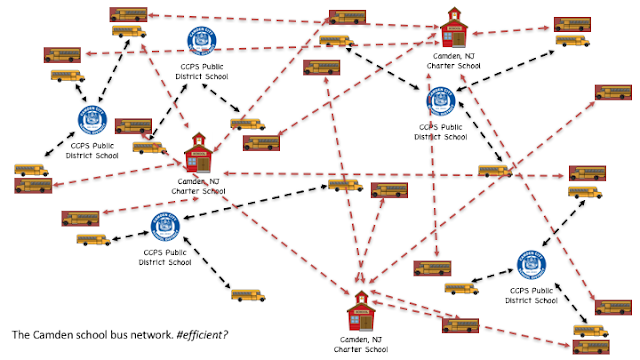 That system is the public schools; arguably, charters couldn't do what they do without it. 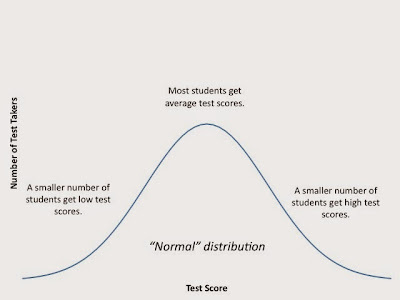 Before we declare charters an unqualified success, we ought to think carefully about whether factors like attrition play a part in helping them realize their test score gains, and what that means for the public school system.